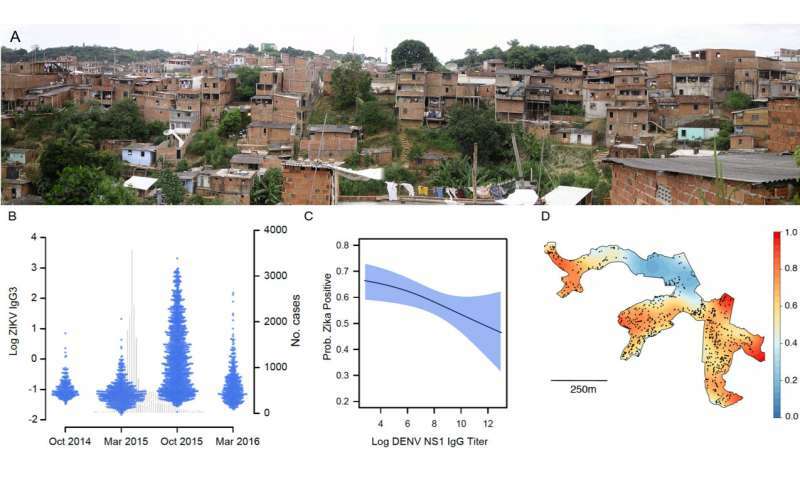 The study—which followed nearly 1,500 people living in a poor neighborhood at the heart of the 2015 Zika outbreak in Brazil—also provides evidence that Brazil's Zika epidemic has largely petered out because enough people acquired immunity to reduce the efficiency of transmission. The scientists suspect several possible explanations: It could be that protective antibodies haven't developed yet or there's something about these people's immune systems that increases their risk of contracting Zika. And the mosquitoes that transmit dengue also transmit Zika, so a recent dengue infection could simply mean they are in a place where Zika transmission is active as well. Developing reliable, commercially available tests for women of child-bearing age to assess their previous dengue and Zika exposure is of immediate concern, along with evaluating recommendations so clinicians know what to do with that information, noted Marques. Testing could help clinicians determine whether vaccinating women against dengue could help protect them from Zika during pregnancy. It also would give a baseline, so obstetricians would know how closely to monitor a pregnant woman's fetus for microcephaly, based on her susceptibility to Zika.